I say “book as object” because there is something extremely appealing about the first issue’s simple, plain, and elegant binding: the cloth is a fairly open-weave textile of oatmeal color, and the decoration is limited to purple text and a block-printed Sphinx device, reflecting the building in the novel that contains the Time Machine. The volume is a pleasure to handle. If Wells could time-travel to the present day, would he be satisfied with seeing his novel on an e-reader? “The Time Machine” was published the same month in England and the U.S. There is debate as to which edition appeared first, but Wells preferred the text of the English version and it remains the most collectible. Those seeking a copy should make sure it has 16 pages of undated advertisements for other works published by Heinemann, and the first book listed there should be “The Manxman.” Only 1,500 copies were bound in the cloth binding that so appeals to me, and as always condition will be key to the value: prices can range from a few hundred dollars to several thousand. 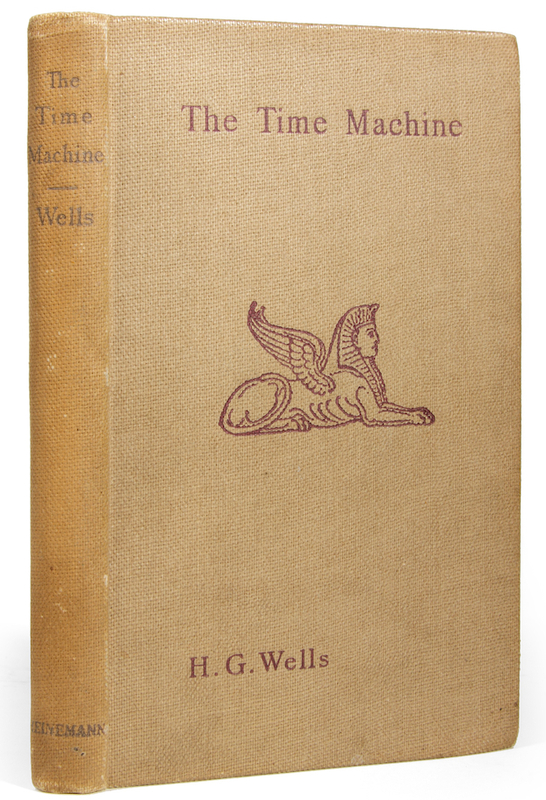 This copy of “The Time Machine” appears in our auction on February 13, 2011, in San Francisco and Los Angeles.